Manuel, A.; Carreras, N.; Bghiel, I.; Hidalgo, A.; Del Rio, J.; Toma, D.M. Manuel, A. [et al.]. 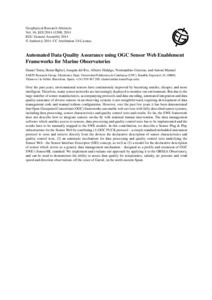 Automated data quality assurance using OGC sensor web enablement frameworks for marine observatories. A: European Geosciences Union General Assembly. "Geophysical research abstracts : an open access publication for abstracts of the Earth, planetary and space sciences". Vienna: 2014.